Located in Altura, 200 meters from the beach, the house is ideal for a family holiday with children, as it has a private outdoor terrace, all sealed. Equipped with Internet and air conditioning, the apartment has 2 bedrooms with double bed and one double sofa bed in the lounge. It is also possible to place one cot (with prior confirmation) .The apartment is located in a quiet area of ​​the Algarve, two hundred meters from the beach with a wide, sandy, and nearby there are restaurants, supermarket, butcher, bakery and pharmacy, eliminating the use of car during the holidays. It offers private parking. The kitchen is fully equipped (fridge, hob, microwave, dishwasher and washing machine, iron, ironing board, accessories and kitchen equipment). The terrace has table, chairs and sun umbrella. It is equipped with piped gas, bed linen, kitchen and towels. 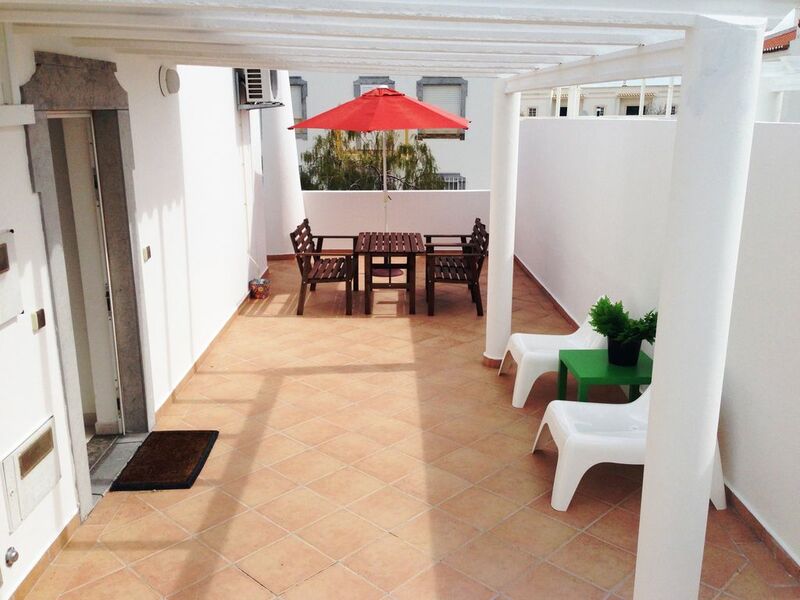 Located 250 meters from the beach of Altura, this beautiful apartment has private outdoor terrace, all fenced, great for sunbathing, with barbecue, table, chairs and sun hat. The accommodation has air conditioning and free Wi-Fi in all areas. The kitchen is fully equipped (fridge, hob, microwave, dishwasher and clothes, iron, ironing board, accessories and kitchen equipment). This vacation home offers free private parking on site. Nearby there are restaurants, pharmacy, minimarket, butcher, bakery and newspaper stand, not to mention the use of the car during the holidays. The area is famous for playing golf and a variety of golf courses can be found about 10 minutes drive away: Monte Rei Golf, Quinta da Ria Golf Course, Benamor Golf Course, Quinta do Vale Golf. The nearest airport is Faro International Airport, 45 km from the accommodation (possibility of transfer, upon prior request and at an additional cost). Nice place, very communicative owner. Great close location to beach and private. Needs better cable TV and Tv. Has good condition AC and electronics. Altura was a perfect location to travel around the Algarve. It was quiet safe and very picturesque. Gostei do apartamento, que é bastante espaçoso e está muito bem equipado. O terraço com barbecue e mobiliário é excelente para todas as refeições. A localização do apartamento também é excelente, porque fica perto da praia e do centro de Altura, mas, ao mesmo tempo, está situado num ambiente sossegado e bom para descansar. Obrigada! Nem sei por onde começar...... o local magnifico, a casa 5 estrelas..... tem tudo quanto necessitamos para umas férias maravilhosas! o Terraço, ai o terraço muito bom!!!! Trés bon séjour à ALTURA ,appartement trés agréable ,proche des commerces et de la plage. Beach with a long beach of fine white sand, no rocks. Magnificent for those who enjoy long walks by the sea and ideal for children. It is the beaches with the weather and warmer water in the Algarve due to its proximity to North Africa and during winter the area has a mild climate. Height is a fishing village, calm, but with all the necessary infrastructure to provide you with a great stay, eliminating the use of car. 30 minutes from Faro airport. Old Cacela (historical village) is 4km, the historic towns of Castro Marim and Tavira are less than 20 Km. Nice ride a Spain that is only 7 km (by car or by ferry) and visit Ayamonte, Huelva (50 Km) or Seville (120 km). There are festivals and cultural events (Carnival of Loulé, beer festival and seafood). Boating on the River Guadiana (VRS António). Casino Monte Gordo 6 Km. Na época alta, os períodos de arrendamento são sempre de Sábado a Sábado. Os animais domésticos são permitidos, sujeitos a uma taxa adicional de 75€ por animal.